The game designers at Slotland.com have come up with another completely unique, one-of-a-kind online slot machine. 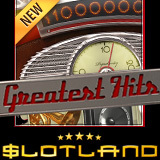 Slotland.com’s new Greatest Hits slots game is a retro-style tribute to the music industry. It’s a beautiful five reel, 19 payline no download slots game with a bonus game where players can top the charts with their gold and platinum records – and multiply their winnings up to five times. The hit record “Disc” symbol is the Scatter and three Discs trigger the unique bonus game where wannabe music moguls release a new album and sell as many records as possible before the album loses its “Hype”. When an album tops the charts or goes on tour Hype increases but if the Popularity Meter drops to zero the bonus game ends. Albums continue to sell as long as the bonus game continues earning silver, gold, platinum or diamond awards. These multiply winnings by 2x, 3x, 4x and 5x. Every day until May 15th, $50 Free Chips will be given to ten randomly selected Greatest Hits players. A total prize pool of $3,500 will be awarded. Greatest Hits celebrations will continue throughout May. There will be a contest on Facebook next week where players will be sharing screen shots of their own greatest hits. Then the Best Bettor contest May 21–27 will award $2250 to players that try the new game. Greatest Hits is one of Slotland’s twenty-five one-of-a-kind video slots and video poker games. Several are also available as mobile slots. Like most of the casino’s slots games, the new Greatest Hits is tied to the site’s progressive jackpot which was reset after recent $68K and $181K wins and is currently over $75,000.